Iliotibial band syndrome (ITBS) is a common knee injury that usually presents with pain and/or tenderness on palpation of the lateral aspect of the knee, superior to the joint line and inferior to the lateral femoral epicondyle.. It is considered a non-traumatic overuse injury and is often concomitant with underlying weakness of hip abductor muscles. Overuse is thought to be caused by repetitive knee flexion and extension movements frequently seen in cyclists and runners . This repetitive motion causes excessive friction between the lateral femoral epicondyle and the iliotibial tract. Studies have described an ‘impingement zone’ occurring at, or slightly below, 30° of knee flexion during foot strike and the early stance phase of running. 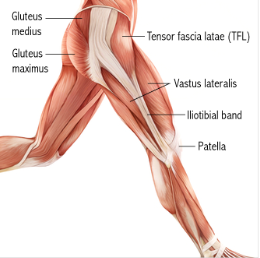 During this impingement period in the running cycle, eccentric contraction of the tensor fascia latae muscle and of the gluteus maximus causes the leg to decelerate, generating tension in the iliotibial band. The iliotibial tract is a thick band of fascia that runs on the lateral side of the thigh from the iliac crest and inserts at the knee. It is composed of dense fibrous connective tissue that appears from the m. tensor fasciae latae and m. gluteus maximus. It descends along the lateral aspect of the thigh, between the layers of the superficial fascia, and inserts onto the lateral tibial plateau at a projection known as Gerdy’s tubercle. In its distal portion the iliotibial tract covers the lateral femoral epicondyle and gives an expansion to the lateral border of the patella. While the iliotibial band does not have any boney attachments as it courses between the Gerdy tubercle and the lateral femoral epicondyle, this absence of attachment allows it to move anteriorly and posteriorly with knee flexion and extension. Histologic and dissection study of the iliotibial band at the lateral femoral epicondyle and gluteus maximus and fascia lata suggest a mechanosensory role acting proximally on the anterolateral knee. Figure  This mechanosensory role may affect the interpretation of the ligament versus tendon function of the ITB from hip to lateral femoral epicondyle. The etiology of Iliotibial Friction Syndrome is often multifactorial. ☃☃When the knee is positioned in extension the iliotibial band lies anterior to the lateral femoral epicondyle. When the knee is positioned in 30° of flexion the band moves posteriorly to the lateral femoral epicondyle. Friction can therefore occur between the posterior edge of the iliotibial band and the underlying lateral femoral epicondyle. Muscle weakness of the hip abductors is also be associated with iliotibial band syndrome as this causes increased hip internal rotation and knee adduction. This was found as a significant issue for athletes with iliotibial band syndrome. Other proposed etiologies for IT band syndrome include compression of the fat and connective tissue that is deep the the IT band, as well as chronic inflammation of the IT band bursa. ITBS is one of the most common injuries in runners presenting with lateral knee pain, with an incidence estimated to between 5% and 14%. Further studies indicate that ITBS is responsible for approximately 22% of all lower extremity injuries. In many instances the subjective assessment will already provide an excellent basis for suspicion of this syndrome. Activities that require repetitive activities involving knee flexion-extension are usually reported, as well as a burning pain at the level of (or just underneath) the lateral femoral epicondyle. The diagnosis in patients with this syndrome is based on different symptoms. The main symptom of ITBS is a sharp pain on the outer aspect of the knee, particularly when the heel strikes the floor, that can radiate into the outer thigh or calf. The pain tends to be worse when running or coming down stairs. There may be an audible snapping sensation the knee bends due to the band flicks over the bony tubercle. There may also be some swelling on the outer side of the knee. Among the characteristics, we find an exercise-related tenderness over the lateral femoral epycondyle. The patient may experience, on a regular basis, an acute, burning pain when pressure is applied on the lateral femoral epycondyle with the knee in flexion and in extension. Sign of inflammation due to the friction between tract and the lateral epicondyle during extension and flexion of the knee can also be found. There is pain on the lateral aspect of the knee during running, increasing in intensity while running down hill. Pain is also exacerbated when running a long distance. Biceps femoris tendinopathy, degenerative joint disease, lateral collateral ligament sprain, lateral meniscus repair, myofascial pain, patellofemoral stress syndrome, popliteal tendinopathy, referred pain from lumbar spine, stress fractures, and superior tibiofibular joint sprain. Knee osteochondritis dissecans, meniscal injury, overuse injury, peroneal mononeuropathy, trochanteric bursitis. The force of hip abductors can be decreased. These muscles should thus be tested. This test is described in several studies as a valid, effective, and sensitive method of evaluating the effects of treatments for running related pain and is used to measure the amount of pain that subjects experience during normal running. If this includes pain to the lateral side of the knee, the test is considered positive. This test starts in supine posture and a knee flexion of 90 degrees. As the patient extends the knee the assessor applies pressure to the lateral femoral epicondyle. If this induces pain over the lateral femoral epicondyle near 30-40 degrees of flexion, the test is considered positive. A goniometer is used to ensure the correct angle of the knee joint. The patient is lying on his side with the injured extremity facing upwards. The knee is flexed at 90 degrees and the hip in abduction and extension, the thigh is maintained in line with the trunk. The patient is invited to adduct the thigh as far as possible. The test is positive if the patient cannot adduct farther than the examination table. A positive Ober test indicates a short / tense ilio-tibial band or tensor fasciae latae, which is frequently related to the friction syndrome. Both the Noble compression test and the Ober test can be use to examine a patient with a suspicion of Iliotibial friction syndrome. The result will be more obvious when we combine the two into one special test. For this, the position of the Ober test is adopted and compression is applied on the lateral epicondyle during passive knee extension and flexion. Moving the knee can produce more strain on the injured structures and can help to reproduce the symptoms of the patient if the combination does not. Medial patellar glide can also increase the symptoms (by tending the patellar expansion of the iliotibial band) and can reveal the precise localization while lateral glides reduces them. An internal rotation of the tibia when the knee is moved from flexion to extension can also produce the symptoms. A combination of the Nobel and Ober tests with an unloaded knee or in a weight bearing position can also be done the reproduce the symptoms. The treatment of ITBS is usually non-operative, and physiotherapy should be considered the first and best line of treatment. Activity modification to prevent further aggravation of the patient's symptoms should be the first area to be addressed in treatment. If it is an athlete their training program should be reviewed and modified as needed. Decreasing the intensity of the trainings, especially the activities that cause pain such as running.Promoting an active rest period is critical with athletes. Patients should be advised to participate in other physical activities, such as e.g. swimming, that do not aggravate their symptoms but all them to maintain their conditioning. Modalities to provide pain relief include ice (cryotherapy) or heat. Some authors suggest complete rest from athletic activities for at least 3 weeks; other authors suggest that it is best to rest a period from 1 week to 2 months, but this rest period depends on the severity of the condition and the reproduction of pain during clinical examination. Iontophoresis or phonophoresis, techniques in which medication is administered into the injured tissue through ion distribution driven by an electric field or passed through the skin using ultrasound waves, respectively. Phonophoresis has been used in an effort to enhance the absorption of topically applied analgesics and anti- inflammatory agents through the therapeutic application of ultrasound. One study evaluated the efficacy of two ITBS treatments: phonophoresis using ultrasound to transport 10% hydrocortisone into subcutaneous tissues, and knee immobilization; the outcome suggests that receiving phonophoresis is a better treatment than just knee immobilization. An alternative treatment strategy is radial shockwave therapy. RSWT is considered safe as it results in minor adverse effects including worsening of symptoms over a short period of time, reversible local swelling, redness and hematoma. RSWT is believed to stimulate healing of soft tissue and to inhibit nociceptors. Thus, it increases the diffusion of cytokines across vessel walls into the painful area and stimulates the tendon healing response. Shockwaves also reduce the non-myelinated sensory nerve fibres and significantly reduce calcitonin gene related peptide (CGRP), and substance-P release. Finally shockwave treatment may stimulate neo-vascularisation in the tendon-bone and bone junction, thus promoting healing. The shockwave treatment uses energy generated when a projectile in a handpiece is accelerated py pressurized air and hits a 15-mm-diameter metal applicator. The energy is then transmitted from the applicator via ultrasound gel to the skin, where the shockwave disperses radially into the tissue to be treated. Radial shockwave therapy is shown to be really effective as rehabilitation program for runners with iliotibial band syndrome. The following exercices will stretch and lengthen the iliotibial band, tensor fascia latae, the gluteus medius and the related structures. Fredericson et al. 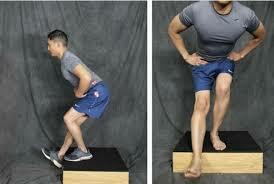 compared the relative effectiveness of 3 common standing stretches for the iliotibial band. This study found that a particular stretch B – with the athlete standing, placing the affected foot adducted and behind the other, and laterally flexing away from the affected side with the arms stretched overhead – created the greatest lengthening of the band. Myofacial treatment is ideal in acute phase, when pain and inflammation in the insertion is felt. The triggerpoints in Biceps femoris, vastus lateralis, gluteus maximus, and tensor fascia latae muscles will be addressed by a myofascial treatment. Frequently, soft tissue treatment through massage and triggerpoint therapy of the affected area by the physiotherapist decreases the pain and definitively treats the condition. The use of a foam roller on the tight muscles could also be beneficial. The patient can also perform exercises using a foam roller at home to create deep transversal friction, self myofascial release (massage) and stretching of the muscles. A possible exercise is to lie on the side with the foam roller positioned perpendicular to the bottom leg, just below the hipbone. The upper leg should be positioned in front for balance. Using the hands for support, roll from the top of the outer thigh down to just above the knee, straightening the front leg during the movement. Pause over any spots where the tissue feels especially tight or knotted, and hold for at least 10 seconds. Reverse the motion, rolling from the knee back up to the hip. Exercises to strengthen the abductor muscles and stabilize the hip. A next important phase in the physical treatment of the ITBS is to perform exercises to strengthen the muscles in the affected area. Since ITBS is often associated with hip abductor weakness, strengthening and stabilizing of the hip will be beneficial in the treatment of ITBS. Some examples of useful exercises: Hip hikes to strengthen the gluteus medius help stabilize the hip. Stand on the edge of a step with the majority of the body weight on the unaffected side. Lower the hip of the involved hip and bring it back to neutral. Repeat the exercise: first 2 sets of 10 repeats, lateron 3 sets of 15 repeats. Another example is the side-lying hip abduction (Figure ) exercise with the back against a wall and the leg held at approximately 30° of hip abduction with slight hip external rotation and neutral hip extension. 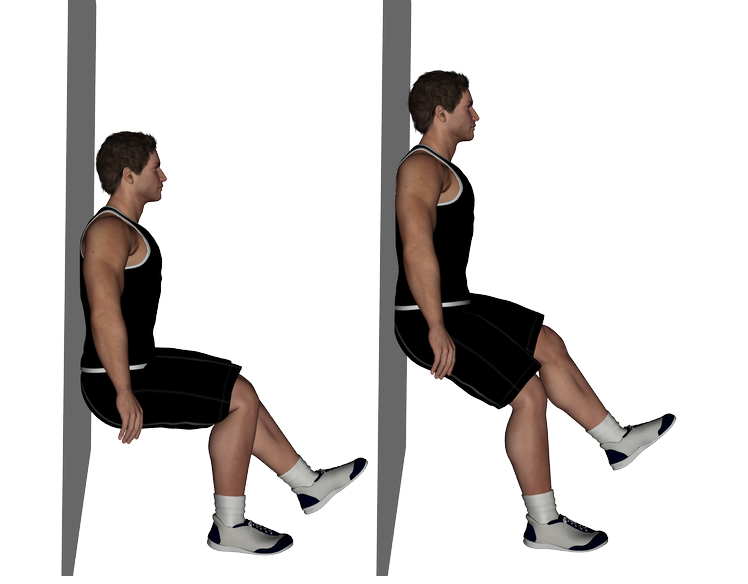 This exercise can be made more stenuous by placing a 1-metre-long band between the ankles. Hip/knee coordination and running/cycling style modification through the increase of neuromuscular control of gait. Going to the next phase of physical therapy, the physiotherapists will give training and instructions on multidimensional movement patterns, eccentric muscle contractions and integrated movement patterns. The main goal is to work with combinations of running, jumping, agility and balance exercises and that all with a clear emphasis on using the proper technique. Cyclist are also at risk for ITBS if they tencto pedal with their toes turned in, which can cause abnormal stretching of the iliotibial band at the knee, so being aware of correct pedaling technique may minimize the risk of developing symptoms. These sorts of exercises need a strictly defined position so that they can be performed correctly. Follow the clear instructions and advice from a physiotherapist. The exercises should be performed slowly until that the patient feels the sensation of stretching. But the prolonged stretching that may causes pain, will decrease the possibility of longer maintenance of the stretching, it also increases the possibility of the muscle contraction that is triggered by a reflex, and it may eventually cause damage to these muscles. On the other hand, keeping the stretching at the “initial” point will enable a complete relaxation of these muscles and the maintenance of the position for a longer period of time. The patient should keep the stretching at the point of the initial stretching for 15s , and then should he increase the time gradually to a maximum of 25s. In some cases in which conservative treatment and physical therapy remain uneffective, it might be necessary to apply surgery.During surgery, a small piece of the posterior part of the iliotibial band that covers the lateral femoral epicondyle will be resected.There are also a number of case series reporting resolution of ITBS from the surgical excision of a bursa, cyst, or portion of a lateral synovial recess. Surgical intervention is not indicated for ITBS except in rare cases in which prolonged conservative treatment has failed to either alleviate the patient's symptoms or resolve the ITBS. Before considering surgery, the physician should investigate other possible sources of lateral knee pain. Lateral meniscus tears and chondromalacia can also cause lateral knee pain. Diagnostic arthroscopy should accompany any surgical procedure for ITBS. Several procedures have been reported to be effective, most of which involve removing a portion of the ITB where it comes into contact with the lateral femoral epicondyle. Z- lengthening of the ITB at the level of the lateral epicondyle has also been proposed. Due to the variety of potential causes of IT band syndrome, it is important for the clinician to consider areas that may be contributing to abnormal body mechanics. Especially with knee conditions, the joints above (hip) and below (ankle/foot) should be assessed to determine if they are contributing to the problem. ↑ 3.0 3.1 3.2 3.3 3.4 Michael D. Clinical Testing for Extra-Articular Lateral Knee Pain: A Modification and Combination of Traditional Tests. North American Journal of Sports Physical Therapy, 2008; 3: 107–109. ↑ Mucha MD, Caldwell W, Schlueter EL, Walters C, Hassen A, Hip abductor strength and lower extremity running related injury in distance runners: A systematic review., Journal of Science Medicine in Sports, 2017;20(4):349-355 . ↑ 7.0 7.1 7.2 7.3 7.4 7.5 7.6 7.7 Strauss EJ, Kim S, Calcei JG, Park D. Iliotibial band syndrome: evaluation and management. Journal of the American Academy of Orthopedic Conditions. 2011;19(12):728-36. ↑ 8.0 8.1 8.2 van der Worp MP, van der Horst N, de Wijer A, Backx FJ, Nijhuis-van der Sanden MW. Iliotibial Band Syndrome in Runners. Sport Medicine, 2012;42(11):969-92. ↑ 11.0 11.1 11.2 11.3 11.4 11.5 Wong M. Pocket Orthopaedics, Evidence-Based survival guide. Jones and Bartlett Publishers, 2009 . ↑ Seijas R, Sallent R, Galán M, Alvarez-Diaz P, Ares O, Cugat R. Iliotibial Band Syndrome Following Hip Arthroscopy: An unreported complication, Indian Journal of Orthopaedics, 2016; 50(5): 486–491. doi: 10.4103/0019-5413.18959. ↑ Khaund R, Flynn SH. Iliotibial band syndrome: a common source of knee pain. American Family Physician. 2005;71(8):1545-1550. ↑ 15.0 15.1 15.2 15.3 Weckström K, Söderström J. Radial extracorporeal shockwave therapy compared with manual therapy in runners with iliotibial band syndrome, Journal of Back and Musculoskeletal Rehabilitation, 2016; 29(1):161-70. doi: 10.3233/BMR-150612. ↑ Krista Simon; Iliotibial Band Syndrome; Nysportsmed, 2015. ↑ Schwellnus MP, Theunissen L, Noakes TD, Reinach SG. Anti-inflammatory and combined anti-inflammatory/analgesic medication in the early management of iliotibial band friction syndrome: A clinical trial. South-Africa Medicine Journal, 1991;79(10):602-6.